Caffeine in coffee and a related compound in tea called theobromine have direct effects in the brain and central nervous system. Thought processes, heart rate, respiration, muscle co-ordination and mood are affected after just one cup of tea or coffee; effects take place within 15-25 minutes. Caffeine increases the circulation of fatty acids. This is shown to enhance oxidation of these fuels. Three or more cups of coffee can give you the jitters and muddle concentration and thinking. Though caffeine can temporarily sharpen reaction time and increase alertness, it can contribute to that mid-morning energy slump. Coffee consumed with food can reduce absorption of mind-enhancing minerals e.g. iron and calcium by as much as 90%. Caffeine can be excreted in breast milk. Aside from the effects of caffeine, oils in coffee can cause gastrointestinal irritation and the tannin in tea may cause constipation. 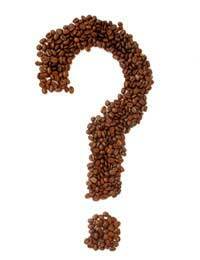 Caffeine can exacerbate certain health conditions such as; ulcers, heartburn, and heart problems. Can Caffeine Help You Lose Weight? A number of studies have indicated that large amounts of coffee (we're talking at least six cups a day!) can slightly increase weight loss as part of a low fat, high exercise diet. But the weight loss is not permanent and caffeine alone has no effect on weight loss. Caffeine will suppress your appetite, though this will only last for a very brief period, once again this will not affect your weight loss program. Caffeine is however a diuretic (it increases you urine output). Gradually switch from regular to decaffeinated coffee by mixing them before brewing. Mix in a higher proportion of decaffeinated grounds each day. When you feel yourself getting sleepy while studying, driving, or working: take a break, open a window, breathe deeply and stretch, jog in place, go for a walk, get a cold refreshing drink, or take a nap! Drink plenty of caffeine-free liquids while you're quitting, such as water, herbal tea, club soda. Drink from smaller cups instead of large mugs or glasses. Herbal Teas; The Healthy Alternative. Not only are herbal teas a healthy alternative to caffeinated drinks, they also have refreshing and reviving qualities. Here is a list of some delicious herbal teas, which can either be bought from your local health store, or made with dried herbs from your garden (one teaspoon of dried herb to a mug of water). Chamomile tea helps to relieve stress and relaxes nervous tension. It can aid insomnia and ease the digestive system. Chamomile is a very soothing herb, nice to drink with your feet up after a hard day's work. It is also believed to help prevent osteoporosis and relieve menopausal problems. Peppermint tea is a great refreshing energizer. It also assists in oxygenating the blood and stimulating the brain. It also helps to reduce tension and is good for circulatory problems, nervousness, insomnia and indigestion. Because peppermint is also a strong antiseptic this tea is also helpful when it comes to treating colds and flu. Fennel tea is a refreshing brew, which aids the digestive system and relieves flatulence.It is also soothing for stomach flu and morning sickness and can help diarrhoea. Fennel is also an excellent diuretic and thus helps to flush toxins from the body. Ginger tea helps to flush toxins from the whole system and thus restores the body's balance. It is helpful to the digestive system and may help reduce craving for sweets and salty items. Ginger works as an expectorant in the respiratory system and helps boost the immune system. Ginseng tea is rich in restorative properties. It helps enhance your stamina and alertness and also helps your immune system. Green tea is excellent for boosting the immune system and aids in the prevention of cold and flu symptoms. Green tea is also good for the digestive system and can help nausea and gastrointestinal complaints. Lemon tea adds a zesty, refreshing tonic to your system. This is an excellent tea for starting the day as it leaves you feeling alert and refreshed and ready to go. Rose hip tea is very high in vitamin C, so it's a good way of keeping colds at bay. Rose hip also has properties which lower saturated fats and triglycerides. This tea is also helpful at lowering high blood pressure.